As I’ve mentioned in previous blog posts (especially the last one), I’ve been frustrated by the grief resources that I’ve found so far. Most books are focused on the grief itself, and encourage us to dwell in our grief until we are “ready” to take a small step in the direction of health and healing. There’s not a lot out there that focuses on action — yet when I think back on the past 8 weeks, it’s the *actions* that I instinctually took that were the most helpful to me. The first few days after Julian died seemed to go by in slow motion, yet my brain was going a mile a minute. I couldn’t stop thinking about the last week of Julian’s life. I constantly re-played and obsessively analyzed every detail, repeatedly asking myself, “What if I had done *that* differently?” There were countless “thats,” and none of them were logical. But logic didn’t stop the loop in my head. Logic had nothing to do with it. I was searching for something that I could go back and change, to result in a different outcome. I wanted to rewind, command-z my life, change history. My brain was on auto-pilot, and was convinced that this would be possible. The day after Julian died was the worst day of this illogical mental treadmill, and by the end of that first day, my brain needed to rest. I don’t think I was able to make the distinction between logical and illogical thoughts at that point. I just wanted to take a break from thinking, period. My instincts told me that these thoughts — and the suffering they caused — weren’t healthy or helpful. But I couldn’t seem to stop them. So at the end of the day, it occurred to me that if I couldn’t stop the mental loops, maybe I could distract myself. So I turned on the TV in our bedroom, picked something from the DVR queue, and tried to relax. Yet there it was again: The Voice. It was back on that mental treadmill. I stuck it on the TV just below the screen, and I got back in bed. I vaguely remember giving John a reason for doing this, but I was operating on instinct… I didn’t really have a reason, other than it just seemed like it would be helpful. And here’s what happened: I would follow the TV show for a few minutes, then my mind would start the loop again. 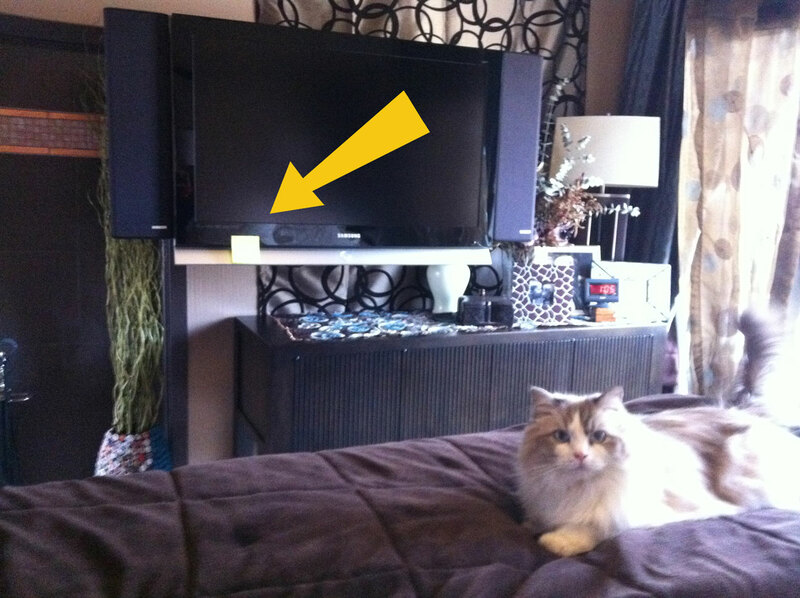 My gaze would drift down from the TV screen — and then I’d notice the bright yellow post-it. I reminded myself that there was nothing to be gained by thinking about this right now. Maybe tomorrow I’d discover a way to turn back time and change the outcome, but not right now. Eventually, the number of minutes between loops slowly increased. I don’t think I really comprehended anything on the TV show that first night, but I had taken one small action and it WORKED. It made a difference that night, and every night since then. Each day, the illogical looping got weaker. Today, thanks to the post-it note and other actions that I’ll describe in future blog posts, the looping has stopped. My brain has given up the hope that it can change the past. 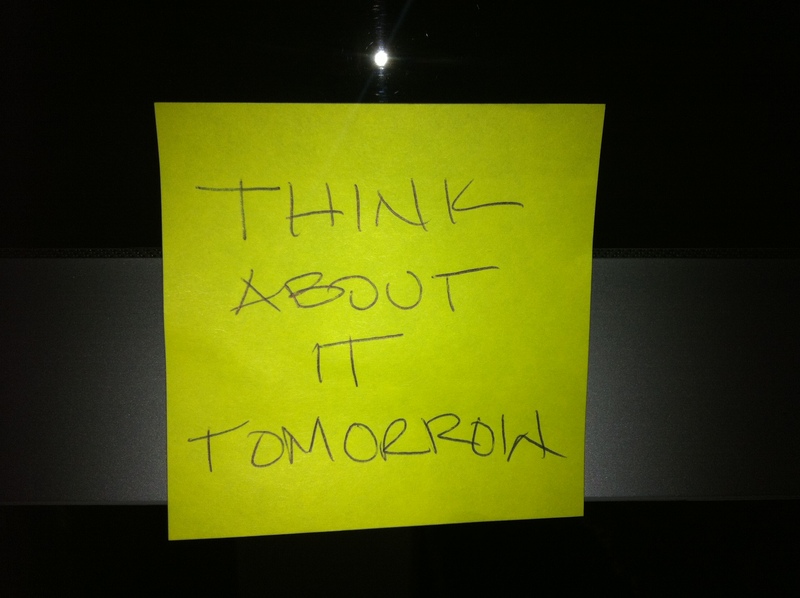 But the post-it is still on the TV, just in case I need a reminder. The post-it is still there, an ongoing reminder to not get stuck in thought patterns that aren’t healthy or helpful — especially right before bed. I can always just think about it tomorrow. Imagine if we treated “mental health trauma” with the same urgency and commitment as physical trauma. Teams of medical professionals, working urgently and comprehensively until the physical trauma patient is stable. Once the patient is stable, the rehabilitation process starts. Doctors and specialists work as a team to make sure that the patient comes to a full recovery. Physical therapy is often painful, but doctors insist that patients work through the pain to regain as much of their previous abilities as possible, and to learn to adapt to any long-term side effects. Medical professionals aren’t involved unless the patient seeks them out. No one works urgently or comprehensively with the patient — in fact, they often work cautiously and slowly, if at all. Religious professionals, family, friends, and others sometimes offer advice, but mostly don’t know where to begin because they don’t have the tools. They are afraid to say or do the wrong thing in case they make the patient feel worse. There’s no “mental health trauma standard of care” that could help the patient’s network of professionals, family, and friends to confidently and effectively provide support to the patient. The doctor thinks about the various surgical and pharmacological treatments that could potentially be helpful to the patient, but he keeps them to himself because the patient is probably not really ready for anything that aggressive, having just been in a car accident. Decades of scientific research and practice enable doctors to know exactly how to treat car accident victims. Doctors don’t hesitate to recommend aggressive, urgent treatments for physical trauma. Car accident victims today aren’t given the exact same treatment as car accident victims 20+ years ago, because there are new medical advancements every year. Physical trauma patients aren’t invited to wait until they are “ready,” because the doctors know that the longer they wait, the harder the recovery will be. Medical doctors don’t shy away from painful physical therapy or bad tasting medicine, because evidence shows that the long-term benefits are much more important than temporary discomfort. Car accident victims typically aren’t told that they should meet regularly — perhaps for years to come — with other people who have been in accidents, to tell their stories and get comforted by others who have survived the same trauma. I’m not suggesting that the treatments of physical and mental health traumas should be identical. But I am suggesting that maybe we need to take a closer look at what I consider to be the biggest difference: when a physical trauma occurs, the medical professionals are in the driver’s seat. The patient is only asked to consent to the recommended treatment; to agree to be passenger in the medical industry’s state-of-the-art car, driving through a pre-defined route on roads that are constantly tested and updated, going as fast as possible but within the legal speed limit. Destination: Recovery. When a mental health trauma occurs, NO ONE is in the driver’s seat. Not the medical professionals or anyone else, because society tells them that a mental health trauma patient is fragile and different than a car accident victim. And certainly not the patient, because society tells us we are in no condition to drive. As a result, most parents who lose children seem to end up stuck in their grief like a car up on blocks in the back yard. Destination: Support Group. I’m not interested in a gentle, passive, when-I-am-ready-I’ll-join-a-support-group approach to my mental health trauma treatment. Like a car accident victim agreeing to painful physical therapy or bad-tasting medicine, I’m ok with temporary discomfort if it brings me long-term healing benefits. I want to take an urgent, comprehensive approach to my recovery from mental health trauma. Maybe it’s time for someone to kick-start a new generation of grief treatment. Maybe this new generation can be focused on science, research, and ACTION, instead of support groups and years of talk therapy. I’ve climbed into the driver’s seat. I don’t care if my roads are bumpy and my route takes some twists and turns, because I know I’m headed in the direction I want to go. A few days after Julian died, I had a conversation with a children’s minister about how children grieve. She explained that children relate to their grief like an object they keep in their pocket. From time to time they take it out, look at it, think about it, and then they put it back in their pocket. Many people have asked me, “How is Oscar doing?” The answer is, he’s fine. Great, really. He has emotional moments from time to time, but for the most part, he’s as cheerful and happy as always. It’s a real blessing to us that Oscar is this way, because he keeps us motivated to feel happy too. I think we can learn a lot from a typical child’s response to grief. It’s interesting to recognize that a child’s response is based on instinct rather than life experience. It’s also interesting to recognize the core difference between my grief and Oscar’s grief: I am grieving the loss of the future that I had planned, Oscar is not. He misses his brother, but Oscar stays in the present. He sometimes takes grief out of his pocket, looks at it, maybe thinks something like “I wish Julian was here to play outside with me today.” But he’s certainly not thinking, “I’m sad because Julian won’t be my best man when I get married.” He might think that on his wedding day, but even then he will be grieving the present, not the future he expected. There could be something helpful about visualizing grief as an object I can keep in my pocket. I can take it out, ponder it, grieve the present instead of the future I planned, design a new plan for the future, create my new normal. Then put it back into my pocket… not for the purposes of forgetting about it, but for the purpose of helping me focus on the present… until I take it out again. Today I had lunch with a dear friend who also has had more than her share of loss this year. One of the things we talked about is how frequently we are asked, “How ARE you?” — usually with a concerned facial expression and tilt of the head. Or worse, “Hey! How’s it going?” — followed by a facial expression that says, oh crap I totally forgot her son just died and of course she’s not doing ok and I can’t believe I just asked her that question. And it happens on my side of the question, too. Someone will ask me how I’m doing, and out of pure habit I answer, “Great! How are you?” And then I’m sure my facial expression says, oh crap of course I’m not ‘great’ and now I probably look like I’m either totally lying or totally in denial and I don’t want to correct myself now but I feel awkward and I just want to change the subject. The real answer is, I’m ok. And devastated. And fine. And heartbroken. And motivated to make the most of life. And exhausted. And excited about being back at work. And struggling to stay focused. And a million other emotions. I’m ALL of these things. Sometimes all at once, sometimes a different one every ten minutes. Because the reality is, I do have good days. Maybe not “great” days, but certainly not the can’t-get-out-of-bed days that I would have expected someone who just lost a child would have. Until that someone was me. Because now I realize, you just don’t know how much you can live through until you have no choice. I can’t choose to bring Julian back to life, but I can choose to honor his life and his memory by working hard on my healing journey. I can choose to not get stuck in the deep well of grief. I can choose to aggressively pursue a future that is filled with happiness and joy. Erasing the line between business and personal. My husband and I own a consulting firm together, so when we experienced this personal loss, it rippled through our professional lives as well. Many of our clients are also people we consider as friends, and it was wonderful to receive their support through emails, cards, and attendance at Julian’s Celebration of Life. There were a few reasons why we decided to share this on the EG site. It kind of started with the “baby wall” in the office kitchen. The photo of Julian was about 2 years old (I’d been meaning to update it forever), so I took it down and had to decide what to do. Leave him off the wall to avoid people asking questions about him? Use a recent photo, and treat him the same as all the other kids? Put up the keepsake photo we passed out at his Celebration, which will draw attention to his story and could make people uncomfortable when we give tours? Ultimately, John and I together decided to go with the latter… the keepsake photo. We decided, this is part our lives now. If we start “hiding” it, or start making decisions based on other people’s potential discomfort, we’d never be able to stop. And, why should we hide it? So then, we gave a tour. When we were in my office, one of our clients saw my set of framed photos of the boys and said, “Oh! Are those your kids?” I knew these moments would happen, but this was the first time. “Yep!” I answered, then walked out of the room and took the group quickly through the kitchen, hoping no one would notice the keepsake photo. They didn’t. So after that day, again we needed to make a decision. Let the topic come up organically? Or just put it out there and get it over with, proactively? Again, we chose the latter. Most of our current clients already know, anyway. Ultimately, even though John and I are introverts, sharing the story in a personal but appropriate way was more consistent with the EG brand. After this month, our newsletter will move on to a less personal topic. But for now, anyone who visits the firm’s website is invited to read our story. There really isn’t a line between personal and professional for us, and that’s just fine. We want to integrate Julian’s memory into as many parts of our lives as we can.